This morning starte das the evening has ended – the sun was shining again. As we joined the comprehensive breakfast in the hut we could see the bright sun. I looked like we have to use much sun cream that day. As we enjoyed our breakfast wich was included in the price we where in a perfect mood for today. Today we had to reach the Zwieselsbachjoch. The highest point and we had a bit mofe than 800 m altittude to climb. We paided our bill and stepped, covered with sun cream, in front of the Schweinfurter Hütte. The trail was right next tot he hut and we hald to walk alongside the mountain creek called Zwieselsbach in direction Joch. The rush oft he creek was our only guide and I enjoyed every single step in this amazing nature. After a short while we couldn´t see the DAV hut anymore. We where now surrounded by mountains and also the sound of the mountain creek has turned into silence. A silence you don´t have that much back home. That´s one of the reasons why we come to travel and hike in the mountains. After two hours of walking time we had to cross the first snow fields and it seemed that we where really close tot he Zwieselsbachferner. The glacier looked very impressive and the bright sun made the snow work like a reflector. Like in the Annapurna region we where wearing our sunglasses constantly. The snow was a bit slippery on top but passing the snow fields wasn´t a big thing in the end. The last part of our climb was a bit exhausting but in the end it was a Sunday walk for mountain hikers with some experience. After 3 hours we stood on top of the Zwieselsbachjoch and enjoyed an amazing view to the Alps in the south. We took a longer lunch break and didn´t speak much. It was just us and the mountains. A really perfect moment! One of the highlights so far. The lunch break was over and we walked down on a steep way in direction Winnebachseehütte. The way turned into a flat trail after a few minutes and we could the the mighty looking Gaiskogel (3.287 m) on our right side. We walked in the high valley and the red and white stone marks led us safe the the DAV hut which we could see after 2 ½ hours. 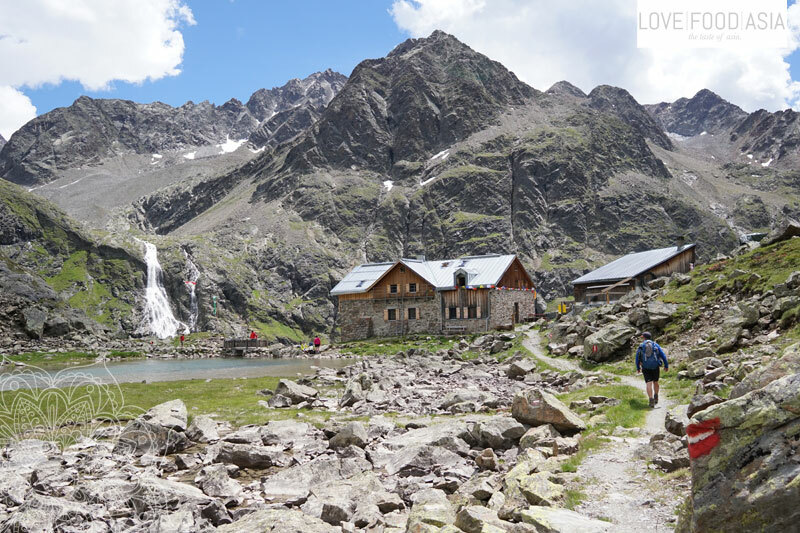 The Winnebachseehütte is one of my favorite mountains huts. It is placed next a small lake and on the opposite side of the hut two waterfalls are falling down into a mountain creek. We got a very small wooden room with two beds where we had a short nap after we arrived. One more time we had a mountaineer meal for dinner. This evening we also had a very good conversation with an eldery couple from The Netherlands. Right after the diner and two beers we felt into bed and the sound of the waterfalls made us sleep really quickly.